I really like this. Just perusin' around looking for ways to compose at home for my animation needs. I am very open to ideas and suggestions in this regard. I stumbled upon this looking for something that can make my new midi controller do something besides sit there all silent. The enthusiasm of the speaker is great and the software itself looks, well... Carraraesque. I actually know these samples very well,. I used to deal with the Miroslav Vituos collection of Sample CD's, before IK got hold of them,. but I also know IK, since their first products.. The MV Collection is still one of the best full orchestral sound samples,. but they're now about 25yrs old,. recording technology, and Virtual instrument synthesizing technology has changes a lot in that time, as has sampling, and recording. It really depends on what you want to do,. and what the IK price of these are now,. IMO there are cheaper alternatives. It is good, but these are samples only. You still need to play / compose. Have a very serious look at Band in a Box. With this you have unlimited options. With BIAB you could add the samples you like, if you want. If you need a DAW, use Reaper. It is a lot cheaper as his competitors and is on the same level as the big boys (A bit like the Carrara situation). But you could do it without a DAW. Not posting links, but you can figure it out. Also search on YouTube with my keywords. A new world could go open for you. I use loop software called Soundtrack that came with Final Cut Pro. It's similar to what you can do with Garage Band, but a bit more advanced. String your music loops together and viola! I did the intro music for my brother and his friends podcast a few years ago using it. Excellent video series! She's just damn cute, isn't she? 3DAGE, I'm glad you can give praise to them. They are actually one of the lowest priced collections I've found - without sounding, well, you know... but suggestion are very welcome. IK sells a download version for peanuts right now. It was the DAW that was stumping me. I have a great controller with 88 weighted keys that I can't wait to use. I'll look into Reaper, thanks. I was also considering, just for starters, anyways, trying out a multi-track recorder to start with. The DAW actually stores the controller data, right? So I could create sequences towards a symphonic finale? That's really what I do want. A DAW is like a mixer you see in recording studios. But, like Reaper, it has ALL necessary hardware included, like compressors, limiter, reverb, etc. And you can save it, render it to CD, MP3. Reaper is the cheapest (I think 60 dollar) and very community driven. They listen to their user and add their request. I read somewhere in an comparison test, "The progress of Reaper is a bit scary. " (In the positive way.) 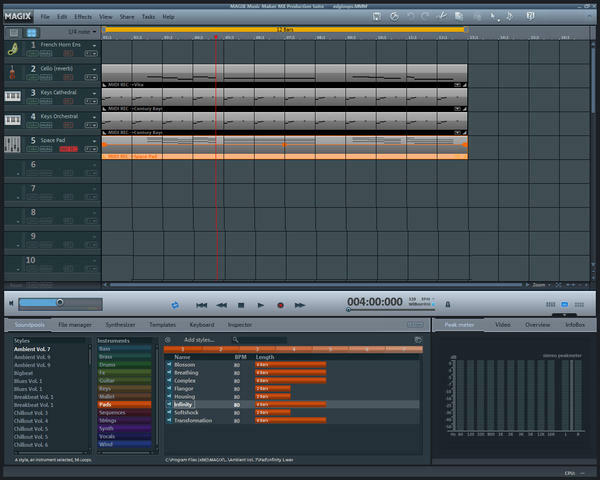 A DAW can be controlled by an external DAW controller, but it can be done with the mouse. You can hook up a synth to BIAB and to a DAW and record. You can also record note by note. You can work with audio and midi in a DAW. Looping, samples, etc. It is almost a complete recording studio. You could do without any form of hardware. Start by downloading the manual. Be careful, you will get addicted to it. There is an excellent magazine called Computer Music for this. With often has free samples, software synths, plugins. And for instance tests of sample libraries. Also have a look at Native Instruments and Kontakt (a very good sampler). Audacity is a very good and free audio editor. I tend to jump between using Ableton Live, and Samplitude. I've just had a deeper look at the IK MV Philharmonik,.. Even if it's a cut down version, I think it's still worth it at that price. I also had a look at it, but it seems the full version, to which you are referring, is now cheaper as the limited edition. Correct me if I am wrong. Dimension Theory had some great music in many of his videos inc his guitar playing as well as computer generated stuff. Lately though he started using Jamendo (I think) royalty free stuff, but I really liked his own stuff. I don't yet have a sequencer, and am wondering what all, I'll need besides my M-Audio and that IK Philharmonic? I looked at Reaper last night, and it looks like a great solution. I believe that would be it, right? Do I need anything else? I do have sound forge as well, for 2d mixing down... bur wouldn't Reaper handle that end? Me too... Well, and I just like Him! He's so cool! I love his products, but half the time, I already know I'll like it if he made it, so I just buy it before I read what it is! His tutorials rock me home. But, as you said, his music is nice. So far the only music I've been using in my videos is royalty free stuff that I've collected from other products I've purchased for production - which comes with RF music - which is cool to have. I'm getting another collection from the makers of Dogwaffe, once that whole thing goes through. If you've ever seen "The Daily Dose", All of the tunes that say in the title, "Also in the CoolCreativeBundle" I'll be getting that - which I think is really great stuff. You know... fun! I really like what Howard Shore did in The Lord of the Rings. Michael Hoenig's Baldur's Gate, too. My Dad used to always play the theme music of "Exodus" and "Genghis Khan" as I was growing up. I really love that stuff. Those two soundtracks got me interested in soundtrack scores way back then. That is what I listen to, when I listen to music. I play drums for all varieties of rock, and for 33 years now it has helped put food on the table. I assume you have read my previous reply? Is a good list, but how do you CREATE music. You have the sounds and a DAW, but not a composer / player. Do you want to play yourself? BIAB could do that for you. Yes, I'd like to perform, myself. I will look more into BIAB next. But that's where I got the Reaper idea... thanks for that because there's such a daunting selection of DAWs. I watched this tutorial on getting started with Reaper, and it lloks like I could call it quits there - from my understanding. It appears that it would give me the ability to create block after block of performances and loop them where they need to be, add this and that till my heart's content, and do a final mix-down. Am I reading this right? I am not new to writing music, but using this type of stuff... yeah. never done it. But I feel comfortable with how to use Reaper, and the IK plugin.... I just don't know if that's going to complete a program, or if I need more. I'll be learning much more as I get the stuff I need. Especially the samples. You can create loopings, but you can also record in midi in Reaper. With midi you can make multiple copies or change the instrument, using your samples. So if you don't like the sound of what you recorded (in midi), choose a different instrument. Instead of an acoustic guitar, you can change it to electric guitar, or trumpet, or....... And for instance, you cannot stretch an audio sample without changing its pitch. With midi it is no problem. I think you have to use Google much more to find answers. Have a look for: keystation pro 88 control Reaper. The first search result goes to the Reaper site (Cockos). Google is mazing. It is one of my tools. sorry for the late reply ..
You should go and download a couple of Demo versions of some easy to use sequencing software,. My advice would be to check out Magix, www.magix.com and download a couple of the demo versions,. they make really accessible sequencing software, which comes with a bunch of sounds to get you going,. ..much like carrara and content. You can also "draw" music into a track, using the Midi editor page, and your mouse,. or, if you play an instrument like a guitar, you can record directly into a track,. then edit or reposition that recorded audio in the time-line if needed. I have a little M-Audio "Oxygen8" keyboard/ midi controller,. it's a simple 25 key keyboard with pitch and modulation wheels, and 8 control knobs . In ANY music making software, I can set up the controller,. and assign any of the knobs to control any value in any track component,. I also play guitar, so I can record that, then add VST effects like Guitar-Rig, to change the sound completely or just to add subtle tone and colour by adjusting the types of Mic, and Amps being "virtually" used to simulate the sound of an electric guitar on stage or in an arena, or studio. and I can add effects like Wah-wah, Fuzz, tremolo, and distortion. or,. using the Midi keyboard,. I can assign the midi track I'm recording to,. to use a VST instrument, such as a grand piano, (real sampled sounds) instead of one of the standard GM sounds. Either way,... some sequencing software is what you need to put it all together,. your PC,. plus an input device, (Midi controller, Microphone, or a musical instrument) and some software where you can assemble / compose. Yeah. I've worked with midi before. In Chicago, I was given a room, a large room, and full access to any of the latest musical equipment in the world, to set up a display. Full access! Funded by the fortune 500 company, Guitar Center. I started with a large hardware product introduced to the public (but years before to specific touring artists, like Niel Peart,) a year or two prior - the Tama Cage, which surrounds the drummer in a cage made of pipes. The entire right side of the drum kit was an elaborate setup of all acoustic drums - including the bass drum and cymbals. The left was a nice assortment of the latest in percussion pads and triggers with three octapads (don't think they make these anymore - what a shame) over head, just above the cymbals, but well in reach. I then had a sound tech (he was also best friends with Stevie Wonder) provide me with all of the latest high end samples and a sound system surrounding the cage in all directions. He took it a step further and added lights and microphones on all of the acoustic parts. I set up the Octapads with an assortment of violin sounds, one set was muted, and we applied a grungy guitar amp effect on those. A comfortable arrangement of the pads to the left were my Bass guitar and a few rhythm guitar sounds and I applied a snare drum sound to the left bass drum pad - so I could play entire drum beats between my feet and right or left hand, depending upon what I needed to do. Adding in a vocal mic with a great effects patch, and I would perform the setup three times a day playing "In the Still of the Night" by Whitesnake all by myself. You see, at that time, Drummers were a very complainy lot. They were peeved at the introduction of drum machines to the market. You know me, the more people complain, the more I get aggressively active to show them why they don't have to be. So this was my (very successful) answer to how the midi world could be answered back by a lone drummer - rather than only being the other way around. Vivian Campbell, lead guitarist from Whitesnake (but not at the time that song was written - but by the time they toured - he was the new lead guitarist) called me a musical genius! I'll never forget that moment! but there's also 21% Italian tax to add to the total,. fortunately the sound-set downloads are split into 9 files. I had a look at LMMS,. but it's too clunky for me,. when a decent simple DAW like magix "Music Maker", can be picked up for under £60. I can carry my experience as music illiterate, looking for a simple product allowing me to easily compose video BGM. I already used Magix Video Deluxe and enjoyed the integrated music features, so when I was offered Music Maker download edition for just €19.99 I grabbed it quickly. I'm actually really satisfied of Music Maker. My opinion is that Magix software in general is easy to use, but it's more than just "software for dummies" and allows an advanced amateurish use. Music Maker itself can be extended with more samples and more VST plugins, not necessarily sold by Magix. I have Magix music maker and recommend it = special offer at moment $100 for premium version.with frree bonus loops. So, you guys are saying to use Magix instead of Reaper, as my DAW, right? By looking at the video, it appears that it would recognize (and allow me to use) IK Philharmonic, if I had that installed. Decisions! Sure looks user friendly. But so does Reaper. Any hints? Yes,. go download Music Maker NOW,. trial version,. if you choose to buy it,. the serial number unlocks the trial. VST's are pretty much universal,. meaning that any music program which can use VST's will see other manufacturers VST's. You can do all the same stuff as in MusicMaker and more especially if you want to record midi instruments. And it will output musical notation if you read. I just wanted to complicate your decision - LOL !!! No... complicate me! Go for it. The more ideas I get the better, I think. Do I really need/want all of those auto-make-music features and loops and such for the extra dough? Definitely worth it if arranging loops and such is what you're after. For a fairly sizable savings, Reaper can take everything I play into it, and let me arrange it from there, in pretty much the same way. I am going to keep an open mind, and keep browsing other ideas. I checked out BIAB, and it is a bit off the path of what I want - but is really powerful and cool, and I will be recommending it to a friend who wants just that. I could get the non-premium Music Maker, which includes lots of stuff, but no 5.1 dolby. I still want to have a look at cu Base, and Sonar, but I have a feeling that the price range will be incompatible with my current funds limitation. Fairly sold on IK Philharmonic though... even if I end up not being able to afford my chosen DAW right away. Speaking with the developer at Dogwaffle yesterday. He started working for Eovia back when they first took Carrara into their lineup - at Carrara ver. 2! He's been using Carrara ever since! Bravo, eh! 88 weighted keys of bliss with an entire recording studio worth of sliders, knobs and controls. My singer bought it for use in his recording studio, but everyone who would use it bring their own gear - so he gave it to me. Over the past couple years, I was under the notion that I'd buy Finale and write up the score, and he would record the Green Bay Philharmonic playing my score. I am not even close to having that in my near future! I've been invited to join the Philharmonic, but I'll have to at least partially retire from stone masonry before I'd be able to commit to that. This whole process is looking like an exiting option that can eventually evolve into my original idea - should I decide to do so. Thank you for helping me in this. Very cool! All versions of Music Maker will allow you to have Midi or audio tracks and record Midi or Audio into those tracks. Overall, Samplitude has many more high level features,. Mixing, Mastering, Score printout,.. etc..
but even the basic Music Maker will allow you to create great music using Audio and Midi. perhaps I could consider samplitude without getting IK, and just put that on a wishlist? Music Maker is not bad, but compared to Reaper it is a toy. It depends on what you want. They are in the same price range. Some of the other real Daw's could be a little bit better as Reaper, but they are much more expensive. Same here, MM isn't even mentioned. Reaper is 65 dollar with free update to the next version. And it is loaded with excellent free plugins. It is a bit like comparing DS to Carrara. With DS you can do a lot, but doesn't come close to Carrara. No, I don't ow shares of Reaper.